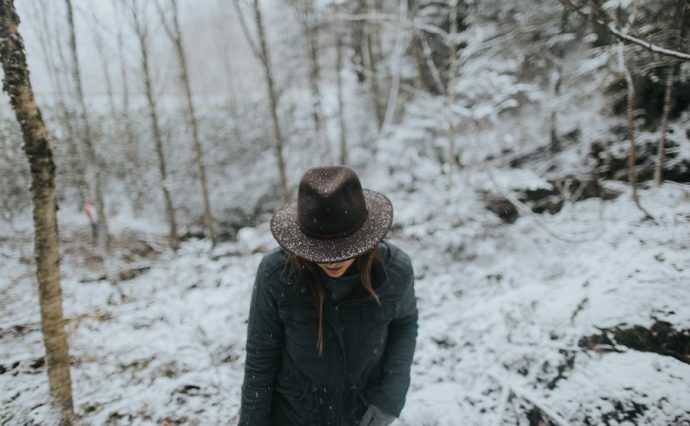 Winter may seem like a total dream for introverts because it’s the one season that provides an abundance of excuses to stay indoors and on the couch. But even us introverts feel the winter blues after a while. Rushing out into a myriad of people certainly isn’t the answer. So what’s an introvert to do? Here are five tips for introverts to beat the winter blues. 1. Step away from technology. I know, I know. Don’t scrunch up your face at me. I love my laptop and cell phone and TV just as much as the rest of you. But the inherent problem with technology is that it’s a little soulless, and we introverts, who by definition have ever-buzzing inner worlds, tend to get sucked into it for hours on end. So, close your laptop and cut off your TV and silence your phone for a little while every day. Consider venturing outside for a walk, because being in nature and getting some sun does wonders for your mood and energy levels. Or, fill that time with an activity that will improve your health (physical, emotional, or mental) in some other way. That could be fixing a healthy meal, doing a little indoor exercise, or whatever. Personally, I love doing yoga on the living room floor. It’s a simple activity that requires almost no setup, and it feels amazing. You may find that you sleep better if you avoid screen time an hour or two before bedtime. Harvard Medical School students found that the wavelengths of light emitted from our devices suppress the sleep-inducing hormone melatonin in the brain. When you sleep better, you feel better. Okay, for this one you have to bring technology back in but, hey, I didn’t say you could never use it. These days, you can literally learn how to do anything on the Internet. If you think about it for a minute, I bet you can come up with something that you’d really like to know how to do. You could learn to play an instrument, cook, sew, speak a new language, etc. There are even quirkier things the Internet will teach you, such as how to do insane tricks with a Yo-Yo or how to teach your cat to eat with a fork (yes, really). It doesn’t matter what you choose. We introverts love challenging ourselves and adding to our vast stores of speciality knowledge, so this should be fun! And, a study found that learning a new skill helps keep your brain sharp — even more than working quietly at home, solving puzzles, or socializing. So, give yourself a goal and cross something off your I’ve-always-wanted-to-know-how-to-do-that list. Then get ready to show off your new skill come springtime. 3. Find somewhere to volunteer. This one will most likely require you to leave the coziness of your couch, but it will be very worth it. It’s as simple as this: Offer to volunteer somewhere you’d like to help out. It could be a soup kitchen, an animal shelter, a park, etc. It doesn’t have to be anything earth-shattering. You could help people you already know. If, say, your grandmother has difficulty grocery shopping by herself, offer to take her to and from the store once a week. Or maybe your neighbor has their hands full with their kids, so you offer to do some pro bono babysitting every now and then. We introverts often have a need for a bigger purpose, and volunteering can do heaps for our souls. And, volunteering is good for you. It’s been shown to help people feel more socially connected, thus warding off loneliness and depression. And it may even reward you with better physical health, including lower blood pressure and a longer lifespan. 4. Don’t pamper yourself too much. Wait, what? I know, let me explain. It’s totally fine to do things that bring you joy and peace, and you don’t need to punish yourself for it. However, too much pampering can push you into nursing your blues into wider, deeper pools. It’s kind of like having a sore and rubbing it so much that it gets infected. Of course, do things you enjoy, and take care of your mental health and introvert energy levels. At the same time, though, hold yourself accountable and don’t let excuses weigh you down. For example, if you’ve chosen to learn a new language as your winter activity, make sure you practice it every day. Don’t let yourself weasel out of it. I promise, you will feel much more accomplished if you stick to your goals and keep moving forward. Otherwise, you will get disappointed in yourself for slacking off, thus making your winter blues even bluer. 5. Schedule a regular social date. As introverts, the word “social” may make us cringe. It’s usually a “thanks but no thanks” kind of situation. But there is a difference between a random social gathering that we feel obligated to go to and a planned, one-on-one outing with a specific person. This winter, choose a person in your life who you enjoy spending time with, and make it a point to hang out with this person regularly. It could be a significant other, a friend, or a family member. It doesn’t matter as long as it’s someone you genuinely enjoy. Choose one day a week — for example, every Thursday for coffee or every Saturday morning for brunch — and make a point of sticking to your social schedule. As much as we introverts like to think that we never need people, we really do. A connection with others is one of the basic needs for overall health. Research shows that socializing improves your mood and decreases feelings of depression. I hope these tips help you get through the winter. Above all, do whatever you need to do to stay happy and healthy. That may mean something different for you. And remember, winter won’t last forever — spring will eventually come!